Round 5 of the Hobie B.A.S.S. Australia Nation Kayak Series on July 19th, Lake Wivenhoe, Qld. [/vc_column_text][/vc_column][/vc_row][vc_row][vc_column][vc_spacer height=”10″][/vc_column][/vc_row][vc_row][vc_column][vc_tta_tabs interval=”0″][vc_tta_section title=”Report” tab_id=”1396571281-1-76″][vc_single_image image=”9440″ img_size=”full”][vc_spacer height=”5″][vc_column_text]Well what a tough final round of the Hobie B.A.S.S. Australia Nation Kayak Series ended up being, with only one fished weighed in, it shows how difficult Wivenhoe can be when your fishing location is limited. Lake Wivenhoe is a massive amount of water, with incredible views, flats, deep ledges and countless amount of banks and structure. The bass located in Wivenhoe can be massive and aggressive through the year, but it seems this time Wivenhoe won the battle. Even though the fishing was tough, the eventual winner definitely had a pattern worked out as he landed 2 bass and dropped another good one at the yak and he caught many catfish and golden perch along the way. 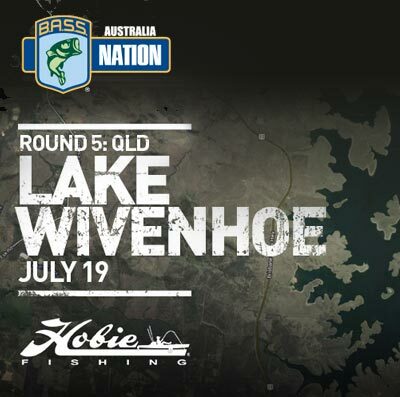 Stephen Maas is an angler in form; just in the Queensland Hobie Kayak events alone Stephen has had an incredible run with a 3rd at Lake MacDonald, a 2nd at the Mary River Round and a win here at Lake Wivenhoe. [/vc_column_text][vc_spacer height=”5″][vc_single_image image=”9441″ img_size=”full”][vc_spacer height=”5″][vc_column_text]Asking about why he’s been fishing so well, he mentioned, “I think the biggest thing is that I haven’t done a lot of bass fishing, so I’ve had no expectations and therefore no pressure to do well. I’ve done the bream comps for the past 8 years or so and the principles of fishing are the same”. These latest results give us an insight in how confidence and momentum work in this sport, once an angler has break through performances they seem to continue the streak for an extended period in their career. Stephen used an 13 Fishing Australia Omen Black matched with a Daiwa Lexar reel spooled with 4lb Berkley Fireline and 4lb Sunline FC Rock leader to present the plastic to the depths near schools of mixed species not far from the start line. Stephen honed his sounder skills on this occasion and it really paid off. As he was travelling to his first location he kept an eye on his electronics and noticed a bait ball with some big arches mixed in between it. This is a tell tale sign of some sort of feeding going on and, he stopped and dropped his Hooked On Plastic 2 ½ inch paddle tail in nightmare colour to the bottom where it got wacked. His plastic was perfectly matched with a TT Lures 1/6th Jighead which held the bass tight all the way through the fight. Stephen wanted to thank his major sponsors Cranka Lures and Hooked on Plastics for their on-going support through the season.